A stumbling visitor to a top museum has destroyed a set of priceless vases which stood on a shelf for 40 years. 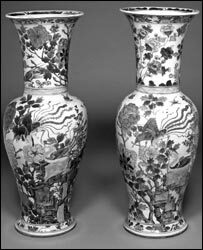 The 300-year-old Qing vases were among the best known artefacts at the Fitzwilliam Museum in Cambridge. The visitor is said to have slipped on a loose shoelace and fallen down a staircase bringing the vases crashing down as he tried to steady himself. The vases, donated in 1948, were said to hold a "significant value" and were among the best known pieces on display. The museum declined to identify the man who had tripped. The accident happened last Wednesday and the museum said it was a most unfortunate and regrettable accident. Margaret Greeves, the museum's assistant director, said: "They are in very, very small pieces, but we are determined to put them back together." A spokesman for the museum said: "An accident at lunchtime on Wednesday 25 January involving a member of the public resulted in damage to three oriental porcelain vases which had been displayed for many years on a staircase window sill. "An ambulance was called but the visitor left the Museum on foot having been seen by paramedics and staff first-aiders. "The damaged porcelain ornamental vases are Chinese, Qing Dynasty, reign of Kangxi (1662-1722), late 17th or early 18th century, painted in enamels in the famille verte palette with traces of gilding." Duncan Robinson, director of the museum, said: "It was a most unfortunate and regrettable accident but we are glad that the visitor involved was able to leave the Museum unharmed. "Conservators are evaluating the damage prior to repair work being considered. Whilst the method of displaying objects is always under review, it is important not to over-react and make the Museum's collections less accessible to the visiting public."